John Paul Gladwell is a rare anomaly -- an innovative multi-instrumentalist, composer, and musicologist who is also a virtuoso classical performer. As a student at Belmont University, he wowed audiences with William Walton's "Five Bagatelles" for classical guitar, while premiering numerous original compositions as a member of the University's prestigious New Music Ensemble. Upon beginning cello studies with Nashville Orchestra principal Julia Tanner, he discovered he was able to play the instrument immediately, and, prodigiously, began appearing with both the orchestra and a string quartet at Belmont within weeks. In 2000, the Augusta Guitar Quartet premiered Gladwell's adaptation of the Irish fiddle tune, "Geese in the Bog" at the P. Buckley Moss Museum in Virginia, while 2001 saw him touring the east coast of the United States, playing electric guitar with the gospel group, The Crawford Brothers. In early 2002, Gladwell released SOLO, a collection of classical guitar pieces, including a definitive rendering of "Asturius Leyenda" by Isaac Albeniz and a transcendent version of J.S. Bach's "Prelude, Fugue and Allegro." After moving to Los Angeles in 2003, Gladwell quickly caught the attention of Hollywood's top professionals, placing songs in The Matrix: Special Edition DVD Box set and Roadtrip Nation on PBS, and attracting a loyal following of high-profile, private students, grateful for his discretion and virtuosity. As a recording artist, he has played on works by pop songwriter Robbie Seidman (Belinda Carlisle, Hillman & McGuinn), and pop vocalist Maria Vidal (Stevie Nicks, Cher, Celine Dion). In 2011, Gladwell experienced a personal thrill when a chance visit to Ornette Coleman turned into an all-night jam session with the jazz great. Gladwell performed traditional American jazz, along with world music and experimental sound collages with his group The Tertianaires in clubs around Los Angeles, and his 2013 production of Lisa Stafford's rock album , "Not Long For This World" had him working with mixing guru Niko Bolas (Neil Young, Don Henley, The Mavericks) in the iconic Capitol Records Tower in Hollywood. While performing in a series of author's readings with PEN/Faukner finalist Bruce Wagner and bestselling crime writer James Ellroy, he met fellow guitarist Alejandro Lazo. As a guitar duo, they were invited to represent the state of California in the prestigious " Festival de Mayo" , held in Guadalajara, Mexico. Playing to a full house at the historic Teatro Degollodo , the concert premiered 2 original works of Mr. Gladwell and modern works by Lou Harrison and Steve Reich. As an encore, the duo played a modern flamenco co-creation. 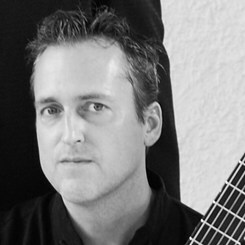 In 2015 John Paul returned to the east coast where he is teaching cello and guitar, performing and preparing to release a recording in the fall of 2016 with works by Bela Bartok, Barrios , and his own compositions.